Read what people are saying about Zazu Tanzania Safaris! All people dealt with were very friendly. The guide was very knowledgeable and fun to joke around with. Overall, the safari was amazing and for a good price, would definitely go with them again and recommend to anyone considering this company! "Great experience with Zazu tours"
We did a 4 day safari with Zazu Tours, and it was a great experience. Better than we could have dreamed of. A friend had recommended Zazu Tours, based on her previous experience with them. Moses was fast at replying to emails and questions regarding the tour, the price was good and we were in close contact with him both up to, during and after the safari. The safari was great, we went to Tarangire, Serengeti and Ngorogoro and managed to see The Big Five in the four days + a lot of other animals. We had a very competent driver, that went out of his way to give us a great experience, the chef was great and very helpful. In overall we had a great experience and we can only send our best recommendations to use Zazu Tours. There are so many companies to choose from, and it can be difficult to know the difference between the different companies. In our experience one of the major differences is that Zazu Tours are very attentive in providing their customers with a great experience, providing a high level of service and in general being very attentive to their clients (both before, during and after the safari). We can highly recommend booking a safari through Zazu Tours. Me and my friend booked our tour through Moses, who was very helpful with everything. We had a good experience with zazu-tours – we did safari in six days where we got to see Tarangire nationalpark, Serengeti and Ngorongoro crater. We were a mixed group of four people and we had so much fun every day when we drove around the National Parks to look for animals. Zazu tours was great! I booked it via Moses, who is extremely friendly and trustworthy. The safari was amazing… I did a 6 day trip, starting in Tarangire, through Serengeti and ended in Ngorongoro. The food was very nice.. the cook is very friendly and certainly knows how to cook! We saw every animal we wanted to see.. missed none! The big five and my personal favorite: hyenas! On the price: totally affordable, no doubt about that. In short, a great adventure! Great guiding, food and perfect value for money! Enjoy the animals and the great landscapes! We had a very good experience with Zazu tours. Good and friendly service, great food from a nice chef, and fantastic parks. Our guide was good to find the animals, and we saw everything we wanted! Very good Company! I was lucky enough to be able to find Zazu Tours to experience the Tarangire National Park, The Serengeti, Ngorongoro Crater, and Ol DuPai Gorge. Even with the great deal of excitement I had for this trip, I was completely taken away by the natural beauty I experienced during this trip. Further to this, the variety of terrains from the jurassic park like rainforest of the Ngorongoro crater to the vast planes of the Serengeti, made me feel like I had visited four different worlds in the period of 4 days and completely revolutionized the my depth of understanding for the beauty you could see in Tanzania. The guides did a fantastic job of bringing us to a variety of different landscapes and showcasing many different animals. Not only did they provide extensive knowledge of the animals and scenery we were seeing but also how the Tanzanian culture linked to these animals. Having gone on a couple safaris in East Africa since then I’ve found no one better at this. For anyone considering a safari in East Africa I would highly suggest Zazu Tours to experience the immense beauty of Tanzania!! I’m taking the time to write a review for Zazu tours because it was simply the most magical experience I have ever undergone and I think the quality of the service and the organization at Zazu tours needs to be recognized. They took care of the safari trip from A to Z and all we had to do was to admire the beauty of the landscape, spot animals through our binocular and soak it all in… And that’s exactly what you want to be doing on a safari trip. These guys (the guides) knew there business, they knew exactly when and where to take us to see the most incredible animals, trees and landscape which made our experience absolutely amazing. I will never forget those sunrises in the Serengetti. Without the shadow of a doubt, riding in the safari truck with the Serengetti breeze blowing in my face and an exhiliarating of excitement in my gut at the possibility of spotting a cheetah or a rhino at any time is my single most treasured memory. The fact that the guides were friendly, knowledgable and the trip was well organized was just a bliss on top of that. No regrets whatsoever for having choosing Zazu tour for this once in a lifetime experience! I had an amazing time with the Zazu Tours company in the summer of 2011! Going into this safari I perhaps had the typical Western idea of what I was going to see, which closely resembled the opening scene from the Lion King movie. This safari certainly met and exceeded my high expectations! Over 4-5 days we went to Ngorongoro Crater, Tarangire Park, the Serengeti, and Olduvai Gorge. The number of animals that we saw was absolutely breathtaking, including big game like elephants, giraffes, zebras, wildebeest, lions, leopards, cheetahs, hippos, crocodiles, and ostriches. We also saw some of the smaller animals including flamingos, antelope, gazelles, baboons, and monkeys. I’m probably forgetting some, but it was all so overwhelming that I would have to flip through my photos to jog my memory. Our tour guides, Moses and Ramon, were some of the most friendly guys I’ve ever met! They were both really excited to show us all of the different animals and were very knowledgeable in pointing them out and explaining different aspects of the animals’ lives and habitats. Before I went I was a little nervous about camping in a National Park in Africa with lions and hyenas, but the area where we stayed was enclosed and safe and once I saw the facility I was comfortable. I would ABSOLUTELY recommend this safari to anyone who plans to spend time in Tanzania. I hope to return someday soon, and this safari will certainly be back at the top of my to do list! This company is incredible. They are all hard workers and genuinely nice people. The trip was amazing, life changing even! I had the time of my life and met people that i am now so close to. Zazu has become a part of my life, and it has changed my life for the better. I recommend this company 100%. I will be going back. "The Safari of a Lifetime"
I have been on four Safari’s so far in East Africa and the one organized by Zazu Tours and Safaris tops my list. It was so well organized and the staff were incredible. Our guide was extremely knowledgeable and our cook made sure that there was an abundance of delicious local cuisine. And nothing beats camping in the middle of the Serengeti. Truly the experience of a lifetime. I highly recommend Zazu Tours and would love to go back and Safari with them again. 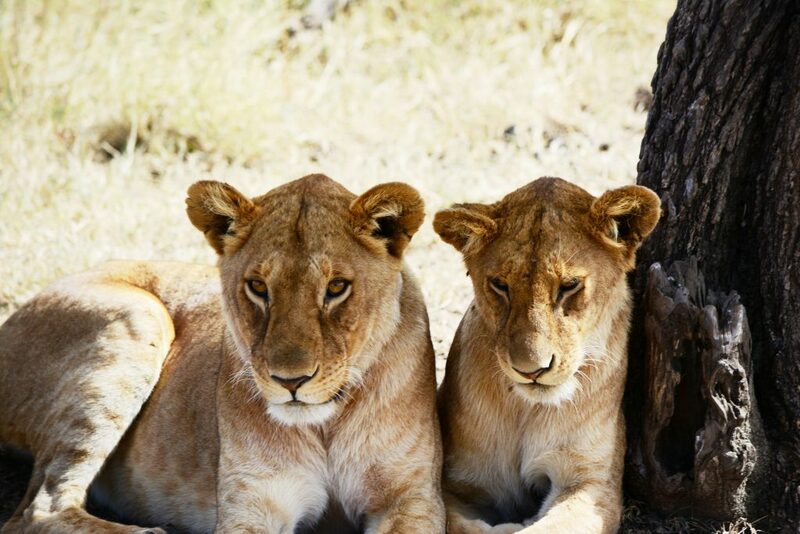 "Outstanding Safari Experience & Great Value!" I was incredibly fortunate to go on a 4 day camping safari with Zazu tours which was absolutely jaw-dropping! We visited Tarangire National Park, The Serengeti, Ngorongoro Crater, and Ol DuPai Gorge (the Cradle of Mankind). We saw hundreds of Zebras, Elephants, Flamingos, Antelope, Wildebeasts and Gazelles. As well as Lions, Hippos, Baboons, Crocodiles, Monkeys, Secretary Birds, Dik Diks, Ostriches, Water Buffalo, a Leopard, Cheetahs, Warthogs, Cranes, and many other different varieties of birds. We were even lucky enough to see some of lions mating and hunting! The food was absolutely delicious and camping was such a great experience. At night you could hear the zebras braying and the hyenas laughing. All the tents were in excellent condition, the safari trucks were clean and comfortable. The drivers were very experienced and I always felt safe. Zazu tours really offers superb value for money! It was such an unforgettable experience. We were very lucky in our car as we had Ramon (our driver & guide) and Moses (guide) who both had a plethora of knowledge and also a great eye for spotting many of the animals. I learned so much and was awed throughout the whole weekend by everthing that we saw and learned. I can’t emphasize enough how beautiful Tanzania is, both the landscape and the people. If you have any opportunity it is so worth a visit! The landscape is so varied and since the rainy season had just ended it was really lush and green. If you’re planning a trip I highly recommend Zazu Tours for your safari experience! "My experience with Zazu Tours was amazing! It was honestly the best experience of my life!" Review Header * Give us a one-liner title for your review! Please leave your review of Zazu Tanzania Safaris here.